Patricia Fauque, M.D., Ph.D., Etienne Audureau, M.D., Ph.D., Roger Leandri, M.D., Ph.D., Lucie Delaroche, M.D., Stéphanie Assouline, M.D., Sylvie Epelboin, M.D., Pierre Jouannet, M.D., Catherine Patrat, M.D., Ph.D.
To determine the prognostic impact of the embryo nuclear status at day 2 among other major morphological parameters (first cleavage at day 1, number of blastomeres and anuclear fragmentation at day 2) on the birth rate. 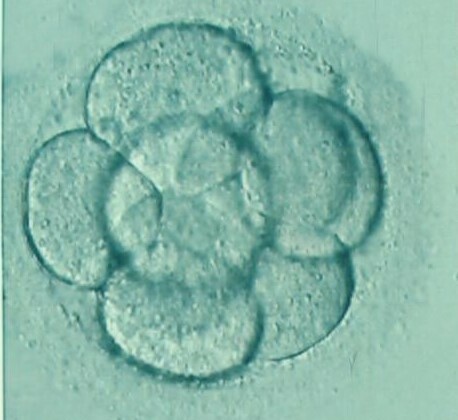 Women undergoing 1,629 day 2 transfers of 2,732 embryos from May 2006 to November 2008. Four groups constituted according to the embryo nuclear status. Implantation, miscarriage, and birth rates. Univariate analysis indicated significant higher birth rates when all blastomeres were mononucleated (15.0%) compared to embryos with not all blastomeres mononucleated (9.2%), embryos without any visible nucleus (7.7%) and embryos where at least one blastomere was multinucleated (4.2%). Multivariate analysis found significant decreased birth rates when multinucleated blastomeres were observed. Blastomere nuclear status should be added to the kinetic and morphological criteria traditionally used at day 2 to assess human embryo quality. The presence of multinucleated blastomeres has a negative impact on birth potential. The results argue for integrating the blastomere nuclear status at day 2 with the kinetic and morphological criteria traditionally used to define the best embryo to transfer. Embryos with a single visible nucleus in all blastomeres should be given priority for transfer when available.